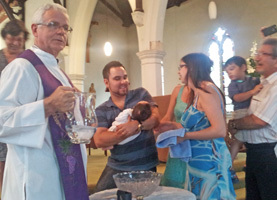 The last monthly Mass in 2014 for Brisbane’s Catholic Brazilian community included a baptism with historic connections. 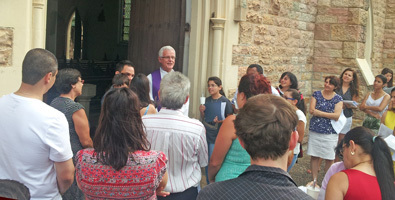 Former missionary in the Marist mission district of Brazil, Portuguese-speaking, Fr Paul Mahony SM, officiated at the baptism of Giovanni Francischi dos Prazeres who was clothed in the 100-year-old gown used by both his grandfather and his great grandfather. 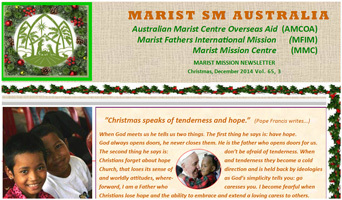 Click for the end-of-year newsletters from the Marist Mission Centre and Marist Laity Australia. 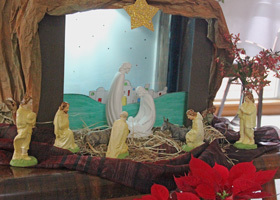 A delightful four minutes video, capturing the Christmas event... produced by the children of St Paul's school, Auckland, NZ. 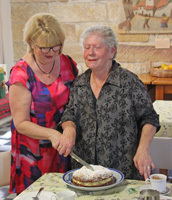 The Marist community of Villa Maria, Hunters Hill, is grieving the loss of two esteemed and much-loved staff members, Mrs Jenny Piliotis and Mrs Jan Snelling. 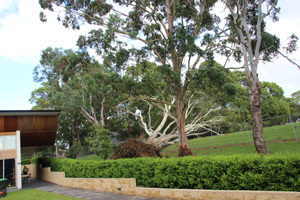 Both have served the 'inner men' of Villa Maria during the past decade, and both have had changes in family circumstances leading up to their leaving. 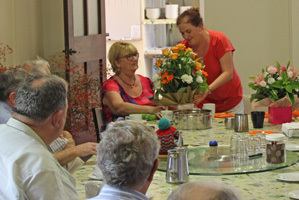 Mourning Marists did their best to offer Jenny and Jan a cheerful and sincere farewell at a special afternoon tea on Dec 22. 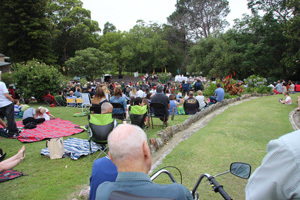 Farewell, Jenny and Jan - and a huge thankyou! 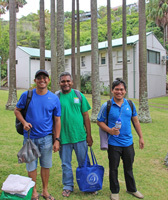 The last participants of the MAP 'Spirituality & Lifestyle' program have left Sydney for their missions in the Pacific, Thailand and the Philippines. 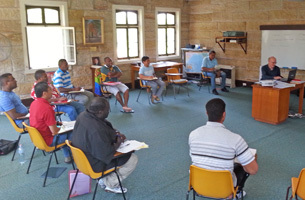 The ten-week 'S&L' ongoing formation experience was the fourth and final such course to be conducted in Australia by Marist-Asia Pacific. 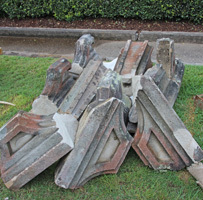 Workman recently removed scaffolding, broken and decayed materials and construction gear to reveal Holy Name of Mary Church, Hunters Hill, in pristine state. The repair and restoration project on the historic building is part of a $500,000 parish program for church and school improvements. 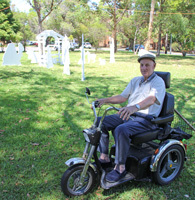 Veteran missionary, Fr Syd Nugent SM, describes the Christmas crib of Villa Maria parish, Hunters Hill, as a 'team effort'. 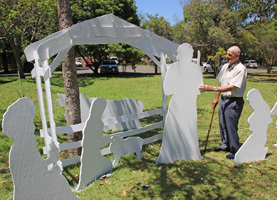 Encouraged by 'Montbel' carers, Fr Syd organised the crib figures to be cut by students at nearby St Joseph's College then erected and painted by parishioner, Greg Knoblanche. 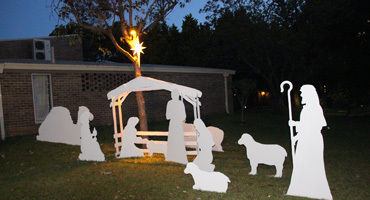 Standing in a park area near the parish hall, the crib is floodlit by night and commands the attention of thousands of passers-by daily - and nightly. 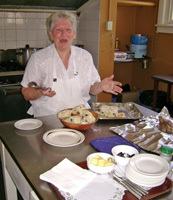 Throughout long years in the Japanese Marist Mission Fr Syd created cribs in Gose, Suzaku and other centres. Well done, Fr Syd! 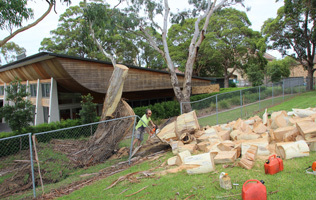 'Now you see it, now you don't' ... in a swift and expert operation yesterday's fallen eucalypt was dismembered and removed from the Montbel site within 36 hours of its demise (see below, 'Tree topples near aged Marists'). 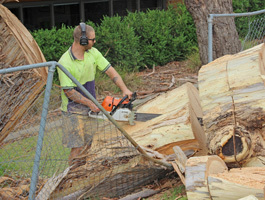 A team of deft woodsmen made short work of the large tree, all in a Saturday morning's work. 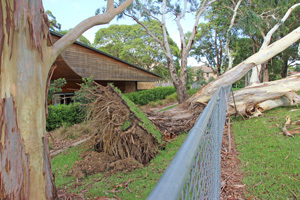 Sydney's violent winds in the early hours of Dec 12 toppled a large eucalypt a few metres from 'Montbel', the Marist retirement facility at Hunters Hill, NSW. 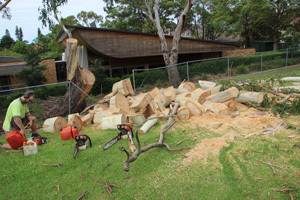 The uprooted tree was one of a line bordering the northern edge of the property. Montbel residents slept peacefully during the incident. 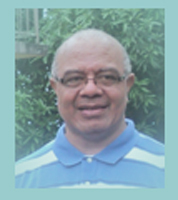 The web site of the Oceania Marist Province has a new webmaster, Fr Ashton Koleman SM, who takes on the role from Fr Willy Melteras SM. 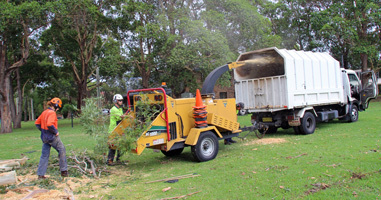 The site has been redeveloped at various times over the past decade, most recently with Australian Province support by Fr Christian Abongbung and Fr Willy and is one of the more 'navigation-friendly', simple and attractive SM web sites. It features large-sized photos-of-the-week, regular Bulletins from the OMP leadership, bilingual (English-French) texts and links to the site's companion Facebook page and other Marist web sites, as well as pictorial coverage of each of the province's nine regions. 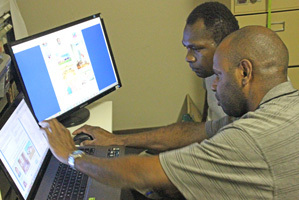 As Fr Ashton moves to his new posting in charge of the Marist mission at Kanosia, PNG, he will take OMP's web laptop and software - and further steps on the webmaster-learning-curve. 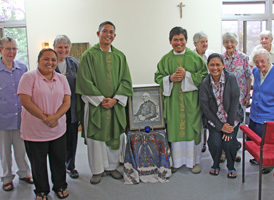 Filipino Marists, Frs Gil Casio and Lionel Mechavez, were visited at Hunters Hill on Dec 10 by two members of Australian Catholic University staff. Director of ACU's Thai-Burma border online tertiary studies program, Mrs Maya Cranitch, and coordinator of the ACU Developmental Studies' Immersion Progam, Dr Michelle Haron, have a keen stake in the work of Marist Mission Ranong which hosts a branch of the ACU online program. Fr Gil directs MMR's health project at Ranong. Mrs Cranitch also offered valuable advice for the running of the 'Bridge Program', conducted online from Australia to assist young Burmese hoping to access tertiary studies. 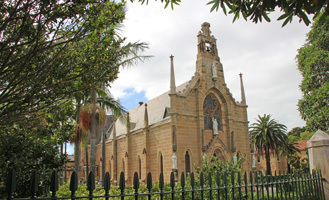 The 2014 'Spirituality & Lifestyle' program of the Marist Asia-Pacific region has ended with Mass at Holy Name of Mary Church, Hunters Hill, NSW, on Dec 10. 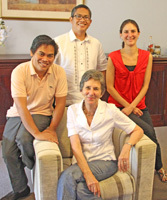 The 10-week Oct-Dec courses began in 2011 and have offered forty younger Marists from Oceania and the Philippines opportunities for study, prayer, reflection and sharing in a range of spirituality and lifestyle areas. 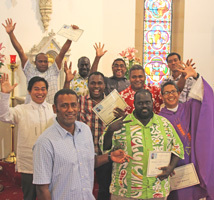 Left: Happy S&L graduates at Villa Maria / certificates presented by Australian provincial, Fr Bob Barber, and assistant-general, Fr Lote Raiwalui. 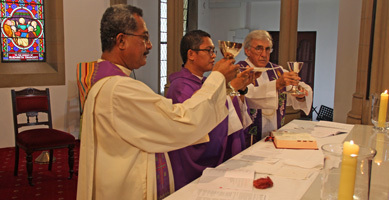 Above: Homilist, Fr Susitino Sionepoe, vicar-provincial of the Oceania Marist Province / Fr Emeri Ratucoko reading | Frs Susitino, Lionel Mechavez and Paul Sullivan (program coordinator) / intercessions in the languages of participants | visiting assistant-general, Fr Lote Raiwalui, reads a message from superior-general, Fr John Hannan / S&L participants and friends in Holy Name of Mary church.
' 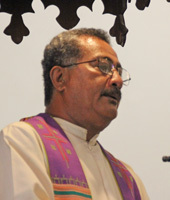 I have just received the news from Fr Jim Ross, in Nadi, that Rafa died this morning, in the presbytery at 7.40am. He has suffered greatly, and borne it patiently, for three years: having diabetes which led to heart stents, kidney failure and transplant, and eventually 3x/wk dialysis. 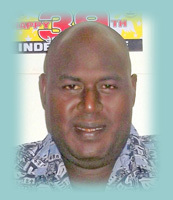 We join the Oceania Marist Province in mourning the passing of Fr Cornelius Giris SM, in PNG, on Dec 03. 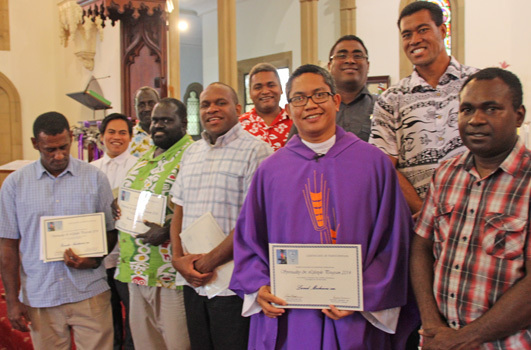 Fr Cornelius, from the Region of Bougainville, participated in last year's Marist Asia-Pacific 'Spirituality & Lifestyle' program in Sydney. 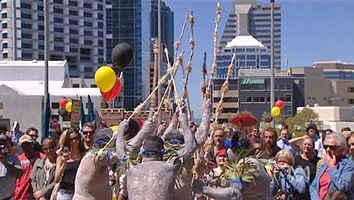 Oceania provincial, Fr Ben McKenna, reports on Dec 03: 'Cornelius has been immobilized for a long time. In the last couple of months he developed heart problems. He has been cared for with great love and attention by our confreres at Marist College Bomana over the the last month, both at the college and in hospital. 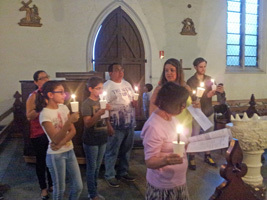 Kiwi Marist, Fr Craig Larkin SM, has published the latest of his illustrated pilgrim resources "Jean-Claude Colin in Rome, a Superior General at work" following the steps of Jean-Claude Colin in his five visits to Rome. The book sets out four pilgrimages through the streets of ancient Rome, each of them following the significant places Fr Colin visited during his five journeys to Rome.